Saint Patrick is the patron saint and national apostle of Ireland. He is credited with bringing christianity to Ireland. BUT 'Why is the Shamrock the National Flower of Ireland ?' St. Patrick used the shamrock to explain the Holy Trinity to pagans. There are several accounts of Saint Patrick's death. 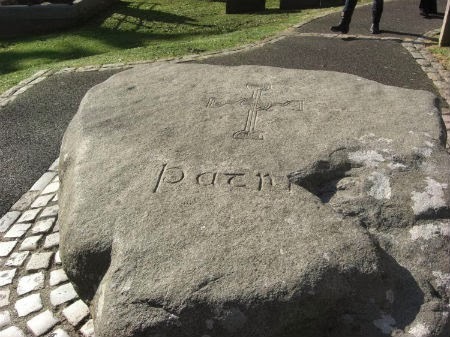 One says that Patrick died at Saul, Downpatrick, Ireland, on March 17, 460 A.D. Another account says that St. Patrick died at Glastonbury, England and was buried there. The Chapel of St. Patrick still exists as part of Glastonbury Abbey. "Patrick, arch-apostle, or archbishop and apostle of the Irish, rested on the 16th of the Kalends of April in the 120th year of his age, in the 60th year after he had come to Ireland to baptize the Irish." After his death there was the legendary "Battle for the Body of St. Patrick" between the Ui Neill Kings of Tara, the Oirghialla and the Ulta (Ulaid) of Ulster.